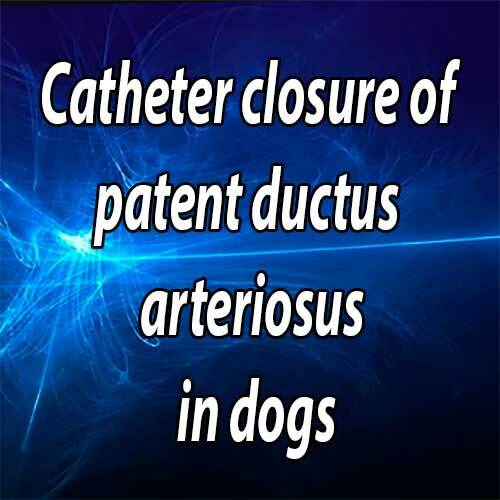 Glaus T.M., Martin M., Boller M., Stafford Johnson M., Kutter A., Flückiger M., Tofeig M. Catheter closure of patent ductus arteriosus in dogs: variation in ductal size requires different techniques // J Vet Cardiol. 2003 May;5(1):7-12. BACKGROUND: Catheter closure of patent ductus arteriosus Botalli (PDA) is increasingly replacing traditional surgical ligation via thoracotomy. A variety of techniques have been described in dogs, although the technique and implant chosen may depend on the minimum ductus diameter. OBJECTIVES: To evaluate the feasibility and treatment of choice of catheter closure of large and small PDAs in dogs. 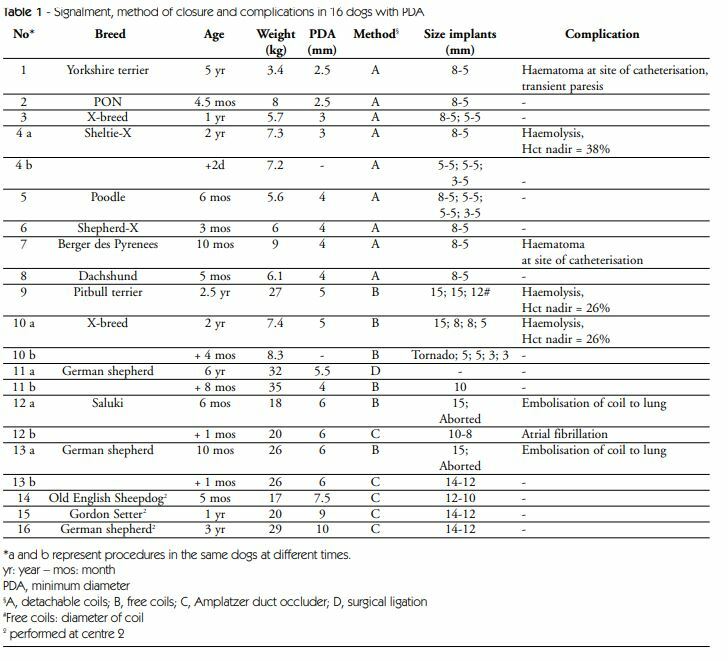 METHODS: In 16 dogs with a PDA, catheter closure was performed using transarterial embolisation using detachable or free coils, or transvenously using an Amplatzer, duct occluder (ADO). RESULTS: In 8 dogs, closure of PDA with a minimum diameter of < 4 mm was achieved using detachable coils; 2 or more coils were required in 3 dogs. In 5 dogs with minimum ductus diameters of > 4 mm, detachable coils were not applicable. In one of these dogs, (incomplete) surgical ligation was performed and later a free coil placed for complete closure. In 2 dogs with moderately large PDA (5 mm), several free coils were implanted. Complete closure was not achieved in either dog and transient haemolysis occurred as a complication. 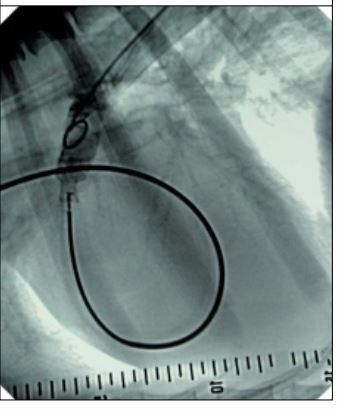 In 2 dogs with a very large PDA (6 mm), implanted free coils embolised to pulmonary arteries and closure was then achieved using an ADO. In 3 dogs with an excessively large PDA (7.5-10 mm) closure was successfully achieved using an ADO with no complications. CONCLUSIONS: Coil embolisation is readily feasible for closure of PDA < 4 mm, less feasible for PDA < 5 mm and unlikely to be feasible to close PDA > 5 mm. Detachable coils are safe for PDA < 4 mm, and the ADO is an excellent device for PDA > 5 mm. Detachable coils are safe for PDA < 4 mm, and the ADO is an excellent device for PDA > 5 mm. Key Words: Ductus arteriosus - embolisation - coil - Amplatzer, - dogs. In recent years, closure of patent ductus arteriosus Botalli (PDA) using minimally invasive catheter-based devices is mostly replacing traditional surgical ligation (via a thoracotomy) in dogs. A number of methods for catheter closure involving embolisation by different devices introduced through the femoral artery or vein have been described1,2,3,4,5,6,7. In Europe, transcatheter embolisation using detachable coils is the most commonly used method for closure of a PDA8,9,10. In contrast, free coils are used most frequently in North America1. The latter type of coil is not held in place by a wire and thus control over its introduction and embolisation is more hazardous than with detachable coils. A new implant is the Amplatzer, duct occluder (ADO), which is a self-expandable, control-release, mushroom-shaped, occluding device11, often used in human medicine for closure of large ducts12,13. Use of the ADO in dogs with PDA appears promising 14. In the present study, the results of closure of PDAs of varying sizes using detachable coils, free coils and the Amplatzer, duct occluder (ADO) are described. The feasibility, success and complications of each method were evaluated for determination of the treatment of choice for different PDA sizes. This case series includes all dogs with a PDA admitted to the Department of Small Animal Medicine and Surgery, University of Zurich, between 1997 and 2002 (centre 1, C1), and dogs with excessively large PDAs referred to the Veterinary Cardiorespiratory Centre, Warwickshire, United Kingdom between 2001 and 2002 (centre 2, C2). In each case, PDA was suspected based on the presence of a characteristic continuous murmur and confirmed by colour- flow and spectral Doppler echocardiography. The treatment options of surgical closure via a thoracotomy or non-invasive catheter closure were discussed with the owners, who all chose catheter closure. The price charged for the different catheter occlusion methods was the same in these dogs and consequently was not an issue for choosing the catheter method. All dogs were premedicated with a combination of buprenorphine (0.01 mg/kg, C1) or morphine (0.5 mg/kg, C2) and acepromazine (0.03 mg/kg). Anaesthesia was induced by intravenous administration of propofol (C1) or thiopentone (C2) (dose to effect to allow endotracheal intubation) and maintained with oxygen and isoflurane (C1) or halothane & nitrous oxide (C2). If insufficient analgesia was recognised during cut-down, fentanyl (2-5 ug/kg bolus, C1) was given intravenously, or additional morphine provided (C2). Monitoring of anaesthesia was performed using an oesophageal stethoscope, capnography, pulse- oximetry, electrocardiography and non-invasive or invasive blood pressure measurement. The dogs were positioned in right lateral recumbency under fluoroscopy, and the medial aspect of the right hind limb was prepared aseptically. The right femoral artery was punctured transcutaneously using the Seldinger technique or by direct cut-down. A 5-F introducer (Cook®) was placed in the femoral artery to facilitate the introduction and changing of catheters. Angiography was performed using a 5-F pigtail catheter (Cook®) in the aorta above the PDA; 1 ml/kg of contrast medium (Rayvist®, Schering; or Omnipaque®, Nycomed) was injected under pressure and angiograms were recorded (6 images/second or onto video tape) in a lateral projection. 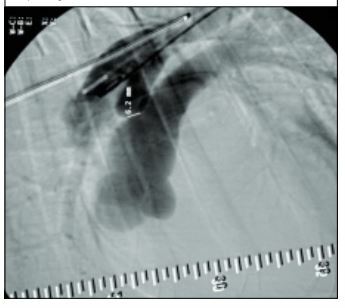 The narrowest region of the PDA was determined on the best image and measured in comparison to a 5 mm ball bearing in the tip of an oesophageal stethoscope or a radiographic ruler placed beneath the dog for reference (Figure 1). Transarterial embolisation of detachable coils for occlusion of a PDA has been described in detail7,8. Briefly, the pigtail catheter was removed and under fluoroscopic-guidance, a 5- F multipurpose catheter (Cook®) was introduced into the femoral artery and advanced through the PDA and into the pulmonary artery. To determine the exact location of the catheter in the PDA, a transducer was attached so that the blood pressure could be measured invasively at the tip of the catheter. Under fluoroscopic control and continual measurement of blood pressure, the catheter was slowly pulled out of the pulmonary artery and into the aorta. The region where the increase in blood pressure indicated transition from the pulmonary to the systemic circulation corresponded to the position within the PDA where the implant was to be placed. This region was marked on the fluoroscopy monitor by an assistant. Detachable coils (Cook®) available at a diameter of 3, 5 or 8 mm were used in six dogs. The coil chosen for use in each dog ideally had a diameter that was at least twice the minimum diameter of the PDA15. The coils were threaded onto a special delivery wire and introduced into the multipurpose catheter. Under fluoroscopic control, the coils were placed in the PDA and released from the delivery wire when they had been stable in the PDA for approximately one minute. Non-stabile coils were removed and replaced by detachable or free coils with a larger diameter. The decision to place additional coils in the ductus was made on the basis of the grade of the cardiac murmur, which was evaluated using an oesophageal stethoscope. The procedure was terminated when the murmur disappeared or became minimal (I/VI). Free coils were used in dogs with a large PDA in which the largest detachable coils (8 mm) were not stable in the ductus. Their method of placement has been described in detail elsewhere1. Free coils are not threaded onto a delivery wire but instead are placed using a regular angiographic guide wire, which is introduced into the multi-purpose catheter. When part of the coil was allowed to remain in the multipurpose catheter, it could be repositioned by moving the catheter. Thus, at the start of coil placement, only one loop of the coil was pushed out of the multi-purpose catheter and placed immediately ahead of the narrowest region of the ductus. The coil was determined to be too small and was removed if the extruded loop was carried into the pulmonary artery. Again, the decision to place additional coils in the ductus was made on the basis of the grade of the cardiac murmur. The procedure was terminated when the murmur disappeared or became very mild (I-II/VI). In five dogs with a large PDA an Amplatzer, duct occluder (ADO) (Drago, Germany) was placed in the ductus. This method has been described previously14. Both the femoral artery and vein were prepared aseptically and direct cut-down was performed. Under fluoroscopic control, a long introduction sheath (Drago, Germany) was placed in the femoral vein and advanced through the right side of the heart, the pulmonary artery, the PDA and finally into the aorta. An Amplatzer, duct occluder (ADO) was introduced through this sheath and placed in the PDA. The minimum diameter of the ADO used was approximately 2 mm greater than the minimum diameter of the PDA. Similar to the detachable coils, the Amplatzer, duct occluder (ADO) was threaded onto a special guide wire. The implant was released after it had been stable in the PDA for approximately one minute and its position was determined to be correct based on the results of repeated angiography (Figure 2). At the end of the procedure, the femoral vein was sutured, the femoral artery either sutured or ligated and the skin was closed routinely. All dogs were treated prophylactically with oral antibiotics (amoxicillin-clavulanic acid) for one week. Of 16 dogs admitted for catheter closure of a PDA, there were 12 pure-bred and 4 mixed-breed dogs, which ranged in weight from 3.4 to 29 kg (median 8.5 kg). Twelve dogs were female and 4 male, and they ranged in age from 3 months to 6 years (median 11 months). The minimum diameter of the PDA was 2.5 to 10 mm (median 4.5 mm). A summary of the signalment and technical data in order of duct size is presented in Table 1. After severe haemorrhagic complications at the puncture site with transient neurological deficits in one had occurred in the first two dogs (No 1, 7) using transcutaneous puncture of the femoral artery by the Seldinger technique7, the method was changed to direct cut-down in the remainder of the patients. Duct closure with detachable coils was attempted in 11 dogs with a duct diameter of 2.5-5.5 mm (No. 1-11). In 8 dogs (No. 1-8), detachable coils were used successfully to close the ductus, which in all dogs had a minimum diameter of < 4 mm (range 2.5 to 4.0 mm). In 2 dogs (No. 3 and 5), the murmur was still clearly audible several minutes after placement of the first coil. One and 3 more coils were then placed until the murmur had disappeared (instead of was disappeared). In one dog (No. 4), a I/VI murmur was present after placement of one coil, and no further coils were placed. On the following day, a III/VI murmur could be auscultated, and macroscopic haemoglobinuria was present. Within 36 hours of the first procedure 3 additional detachable coils were implanted until no murmur was audible. In all 8 dogs, some shunting of blood was still seen fluoroscopically after hand injection of 2-3 ml of contrast medium. Three months after the catheter closure, a cardiac murmur was not heard in any of the dogs and shunting of blood was not detectable with Doppler echocardiography. In three dogs (No. 9, 10, 11) with minimum ductus diameters of > 4 mm, detachable coils could not be placed safely. Dog No. 11 with a minimum ductus diameter of 5.5 mm was referred for surgical ligation by thoracotomy, but closure was incomplete. When this dog developed atrial fibrillation several months later, thought to be caused by volume overload, complete closure was achieved with a free coil. The device is positioned in the duct at its minimal diameter and still fixed on the delivery wire. There is no apparent shunting to the pulmonary artery visible, consistent with complete duct occlusion. In this 2-year-old German shepherd dog (not part of the study), the catheter approach to the PDA was performed from the jugular vein using a 12 mm free coil. In all these dogs, the extruded first loop was immediately carried from the ductus into the pulmonary artery. Thus a larger coil (15 mm) was subsequently employed. In dogs No. 9 and 10, this coil remained in the ductus and 2 and 3 more coils, respectively, were added to reduce the level of the cardiac murmur to a grade I to II/VI. However, one day later, a loud continuous murmur (grade III-IV/VI) was auscultated in both dogs, and within 48 hours both dogs had intravascular haemolysis with transient haemoglobinuria, which lasted 2 to 3 weeks. The owner of dog No. 9 elected no further treatment, because he judged the dog to be normal. At a 3-year follow-up, a II/VI continuous murmur was still audible. In dog No. 10, five additional coils were placed in the ductus until the murmur was eliminated. Some shunting was still detectable by hand injection of contrast medium and fluoroscopy, and was still evident 12 months later by colour Doppler echocardiography. In dogs No. 12 and 13, the 15-mm free coils embolised to the lungs. They were not removed because no negative haematological effects were detected as a result. In both as well as in dogs 13-15, an Amplatzer, duct occluder (ADO) was used to close the PDA. As a complication in one dog advancement of the Amplatzer guide wire through the right ventricle initiated fast atrial fibrillation which was corrected using electrical cardioversion. In none of the five dogs an audible cardiac murmur was present on the day after the procedure. On Doppler studies, very trivial ductal flow was present in 2 dogs the day after the procedure, which was not anymore detectable at a 3 month follow up. In dogs, catheter closure of a PDA can be accomplished using various techniques. Embolisation of detachable coils is a very safe procedure; however, this method cannot be used to close a PDA with a large diameter. Lloyd et al. (1993) recommended that coils with a diameter of at least twice the minimum ductus diameter be used for closure of a PDA15. Thus, detachable coils are mainly indicated for occlusion of a PDA with a minimum diameter of < 4 mm, although successful closure of a PDA with a minimum luminal diameter of > 4 mm has been described51617. In the present study, dogs with minimum ductus diameters of < 4 mm were effectively treated using detachable coils; this method was not efficacious in dogs with minimum ductus diameters of > 4 mm. Embolisation using free coils was possible for closure of PDAs with a minimum diameter of 4 to 5 mm. However, in 2 dogs with minimum ductus diameters of 5 mm, intravascular haemolysis and haemoglobinuria occurred after placement of several free coils, which did not completely occlude the ductus. Haemolysis also occurred in a third dog with a small minimum ductus diameter (< 3 mm). This phenomenon has been reported in dogs10,18 and in humans, where it mainly occurs if significant residual shunting persists after coil occlusion of a larger PDA19,20,21. Haemolysis is thought to be caused by mechanical damage to erythrocytes by a high velocity jet through a residual shunt. The principal concerns of intravascular haemolysis are development of significant anaemia and renal damage potentially resulting in acute renal failure21,22. In similar human cases, residual shunt is usually treated by surgical ligation of the PDA23 or placement of additional coils21. Conservative treatment using haptoglobin and antiplasmin24, and spontaneous disappearance of intravascular haemolysis with residual shunting have been reported as well25. Two affected dogs in our study received no immediate treatment. The reasons for this were that dogs were presented only several days after haemoglobinuria was first noted, their general behaviour, condition and level of exercise tolerance were superior (considered normal) to that prior to the procedure, blood chemistry parameters were normal, and the owner of dog Nr. 9 declined additional treatment. The haemoglobinuria and decrease in haematocrit (Hct) were transient in both dogs, although the intensity of the cardiac murmur remained unchanged. Assuming that intravascular haemolysis persisted in both dogs, a compensatory increase in haptoglobin production and increased erythropoesis could explain the absence of anaemia and haemoglobinuria. The third dog with haemolysis did not either develop clinical or biochemical abnormalities associated with the haemolysis, nevertheless additional coils were placed upon recognition of haemolysis. Similar to Stokhof et al.8, our end point of the placement of additional coils was the disappearance of the cardiac murmur, or its reduction to a very low level, rather than the disappearance of shunting as detected by angiography. In contrast, Schneider et al.9 used only one coil to occlude small PDAs, regardless of the status of the cardiac murmur. Of 19 dogs in that study, 6 had a mild cardiac murmur and 8 had shunting of blood on colour Doppler images, but no haemolysis, three months after the procedure9. Thus, it appears that there is only a small risk of intravascular haemolysis in dogs with a small residual shunt. In contrast, there may be a risk of haemolysis in dogs with a moderate residual shunt, which manifests as a grade III/VI or higher cardiac murmur in the recovered patient. Although the intravascular haemolysis seen in three dogs in our study appeared to be innocuous, early complete closure of the ductus appears prudent in dogs with a re-occurring loud cardiac murmur to prevent serious intravascular haemolysis and its potential sequela. In such cases the development of increasing murmur intensity from I-II/VI to III-IV/VI after the procedure may be explained by spasms of the duct during the procedure caused by the manipulation and that relax after the intervention. In people, to prevent this complication the recommendation is to strive to achieve complete or near complete closure of the ductus by placing as many coils as possible; if residual shunt is more than a trace, the patient shall be kept in the hospital to screen for haemolysis; if there is no evidence of haemolysis within 24 hours the patient can be discharged26. One described technique to achieve best possible occlusion is to place additional coils as long as the duct can be crossed by a 0.035 inch diameter guidewire and a 4 French catheter 27. In 2 dogs with minimum ductus diameters of about 6 mm, the free coils embolised to a pulmonary artery and successful closure of the PDA was not possible. The embolised coils were not retrieved because adverse effects did not occur in either dog, nor were any anticipated2,8. Potential problems that may occur with a dislodged coil is occlusion of a pulmonary artery or it may serve as nidus for haematologically spread bacteria. To quantify the effect of a dislodged coil on pulmonary artery obstruction a lung perfusion scan may be performed 27. Dogs with a large PDA are ideal candidates for an Amplatzer, duct occluder (ADO), because this type of implant can be used to close ducts with the largest diameters and in all duct types 12. This self-centering, selfexpandable, detachable device is very safe and reported complications in humans, although infrequent, include bending of the guide wire with subsequent failure to place the implant, severe blood loss in patients that are difficult to catheterise, narrowing of the aorta with very large implants and embolisation of the implant to the aorta or a pulmonary artery12,13. In one dog in our study, atrial fibrillation with a very high frequency was a complication associated with catheterisation. Cardiac arrhythmia is not a typical complication of the Amplatzer, duct occluder (ADO) technique but rather is a potential complication of any cardiac catheterisation procedure. Likewise, Schneider et al.9 reported that during transvenous coil embolisation, cardiac arrhythmias occurred frequently but usually disappeared spontaneously. The results of the present study indicate that for small dogs (< 10 kg) with minimal ductus diameters < 4 mm detachable coils are ideal for PDA-closure, whereas in large dogs (> 20 kg) with large PDA diameters, an ADO is an excellent implant. For dogs between 10 and 20 kg and PDA diameters between 4 and 5 mm, either free coils or an ADO may be used. Alternative methods of closure of a large PDA include simultaneous implantation of two coils24,28, use of coils of larger gauge (0.052 inches)29, the controlled implantation of free coils using a bioptome30 and the use of a balloon occlusion catheter to facilitate transarterial coil embolisation 31. Nevertheless, taking into account the use of additional expensive items, prolonged procedure time and rate of residual shunting with the alternative techniques, recent recommendations in people are to use coils in PDA diameter of < 3 mm, and for larger PDA (> 3 mm) to use the Amplatzer, duct occluder (ADO)32. Monetary constraints are an issue in veterinary medicine, and costs considerably increase with an ADO or multiple coils. Hence, the conventional surgical ligation by thoracotomy may remain a valuable alternative treatment modality in dogs. A limitation of this study is that angiograms were performed only in one lateral projection which may not correctly assess the minimal ductus diameter. In addition, placing a radiographic ruler beneath the dog may overestimate ductus size. Considering the fact that in several dogs we had to chose a larger coil than twice the measured ductus diameter or a larger Amplatzer, duct occluder (ADO) than > 2 mm, we may actually have underestimated ductus size. With detachable devices underestimation is less of an issue, however, with free coils correct measurement is crucial to avoid coil embolisation to the lungs. Miller MW, Bonagura JD, Meurs KM, Lehmkuhl LV Percutaneous catheter occlusion of patent ductus arteriosus. Proc. 13th ACVIM Forum Lake Buena Vista, Florida, 1995: 308-310. Snaps FR, McEntee K, Saunders JH, Dondelinger RF. Treatment of patent ductus arteriosus by placement of intravascular coils in a pup. J Am Vet Med Assoc 1995; 207: 724-725. Grifka RG, Miller MW, Frischmeyer KJ, Mullins CE. Transcatheter occlusion of a patent ductus arteriosus in a Newfoundland puppy using the Gianturco-Grifka vascular occlusion device. J Vet Intern Med 1996; 10: 42-44. Schneider M, Hagel K-J, Schneider I, Neu H. Transvenose Coil-Embolisation zum Verschluss des persistierenden Ductus arteriosus (Botalli) bei einem Hund. Kleintierpraxis 1996; 41: 685-691. Fellows CG, Lerche P, King G, Tometzki A. Treatment of patent ductus arteriosus by placement of two intravascular embolisation coils in a puppy. J Small Anim Pract 1998; 39: 196-199. Fox PR, Bond RB, Sommer RJ. Non-surgical transcatheter coil occlusion of patent ductus arteriosus in two dogs using a preformed nitinol snare delivery technique. J Vet Intern Med 1998; 12: 182-185. Glaus TM, Gardelle O, Bass M, Kiowski WK. Verschluss eines Ductus arteriosus Botalli mittels transarterieller Coil- Embolisation. Schweiz Arch Tierheilk 1999; 141: 191-194. Stokhof AA, Sreeram N, Wolvekamp WT. Transcatheter closure of patent ductus arteriosus using occluding spring coils. J Vet Intern Med 2000; 14: 452-455. Schneider M, Hildebrandt N, Schweigl T, et al. Transvenous embolization of small patent ductus arteriosus with single detachable coils in dogs. J Vet Intern Med 2001; 15: 222-228. Van Israel N, French AT, Dukes-McEwan J, Corcoran BM. Review of left-to-right shunting patent ductus arteriosus and short term outcome in 98 dogs. J Small Anim Pract 2002; 43: 395-400. Sharafuddin MJ, Gu X, Titus JL, Sakinis AK, et al. Experimental evaluation of a new self-expanding patent ductus arteriosus occluder in a canine model. J Vasc Interv Radiol 1996; 7: 877-887. Bilkis AA, Alwi M, Hasri AL, et al. The Amplatzer duct occluder: experience in 209 patients. J Am Coll Cardiol 2001; 37: 258-261. Koch A, Hofbeck M, Buheitel G, et al. Fortschritte beim interventionellen Verschluss des persistierenden Ductus arteriosus: Vergleich der Ergebnisse mit unterschiedlichen Verschlusssystemen. Zentralblatt Kardiologie 2001; 90: 120126. Glaus TM, Berger F, Amman FW, et al. Closure of large patent ductus arteriosus with the AmplatzerR duct occluder in two dogs. J Small Anim Pract 2002; 43: 547-550. Lloyd TR, Fedderly R, Mendelsohn AM, et al. Transcatheter occlusion of patent ductus arteriosus with Gianturco coils. Circulation 1993; 88: 1412-1420. Hijazi ZM, Geggel RL. Transcatheter closure of large patent ductus arteriosus (> or = 4 mm) with multiple Gianturco coils: immediate and mid-term results. Heart 1996; 76: 536540. Tanaka R, Hoshi K, Nagashima Y, et al. Detachable coils for occlusion of patent ductus arteriosus in 2 dogs. Vet Surgery 2001; 30: 580-584. Van Israel N, French AT, Wotton PR, Wilson N. Hemolysis associated with patent ductus arteriosus coil embolization in a dog. J Vet Intern Med 2001; 15: 153-156. Shim D, Wechsler DS, Lloyd TR, Beekman RH 3rd. Hemolysis following coil embolization of a patent ductus arteriosus. Catheter Cardiovasc Diagn 1996; 39: 287-290. Tomita H, Fuse S, Akagi T, et al. Hemolysis complicating coil occlusion of patent ductus arteriosus. Catheter Cardiovasc Diagn 1998; 43: 50-53. Uzun O, Veldtman GR, Dickinson DF, et al. Hemolysis following implantation of duct occlusion coils. Heart 1999; 81: 160-161. Gildein HP, Onaldi D, Gordjani N. Acute renal failure due to mechanical haemolysis after percutaneous catheter occlusion of a patent arterial duct. Int J Cardiol 1998; 63: 317-318. Perez Rodriguez MJ, Quero Jimenez MC, Herraiz Sarachaga I, et al. Intravascular hemolysis following percutaneous occlusion of the ductus arteriosus. Rev Esp Cardiol 1999; 52: 449-450. Eda K, Ohtsuka S, Seo Y, et al. Conservative treatment of haemolytic complication following coil embolization in two adult cases of patent ductus arteriosus. Jpn Circ J 2001; 65: 834-836. Lee C, Hsieh K, Huang T, Choong C. Spontaneous resolution of hemolysis after partial coil occlusion of ductus arteriosus. Pediatr Cardiol 1999; 20: 371-372. Hijazi ZM. Closure of the ductus and hemolysis: strive to achieve complete closure. Cathet Cardiovasc Diagn 1998; 43: 54. Sreeram N, Tofeig M, Walsh KP, Hutter P. Lung perfusion studies after detachable coil occlusion of persistent arterial duct. Heart 1999; 81: 642-645. De Wolf D, Verhaaren H, Matthys D. Simultaneous delivery of two patent arterial duct coils via one venous sheath. Heart 1997; 78: 210-202. Owada CY, Teitel DF, Moore P. Evaluation of Gianturco coils for closure of large (> 3.5 mm) patent ductus arteriosus. J Am Coll Cardiol 1997; 30: 1856-1862. Kumar RK, Krishnan MN, Venugopal K, et al. Bioptome- assisted simultaneous delivery of multiple coils for occlusion of the large patent ductus arteriosus. Cathet Cardiovasc Interv 2001; 54: 95-100. Saunders JH, Snaps FR, Peeters D, et al. Use of balloon occlusion catheter to facilitate transarterial coil embolisation of a patent ductus arteriosus in two dogs. Vet Rec 1999; 145: 544-546. Hijazi ZM. Catheter closure of ductus arteriosus in adolescents and adults: what to use? Cathet Cardiovasc Interv 2002; 55: 519-520.